To say thank you to my lovely, amazing mother, mother-in-law and grandmother for all their love, support and all round brilliance. I am proud and very fortunate to be related to such wonderful women. To have a lie in bed for a little while longer than usual, instead of being rudely awoken at the crack of dawn by my little son jumping on me carrying all his toy cars, most of which get dropped on my head as he clambers into my bed for a morning snuggle. A cup of tea in that same bed, with a slightly-later-than-usual morning cuddle with both of my lovely, beautiful and bright children. A card, preferably home-made, slightly wonky, liberally applied with glitter and with my daughter’s very own writing inside. Pancakes. With lemon and sugar. They’re not only for Shrove Tuesday, you know. A bit of time for reading my book, ‘I Capture The Castle’ which I’m re-reading in preparation for being a book giver on World Book Night. 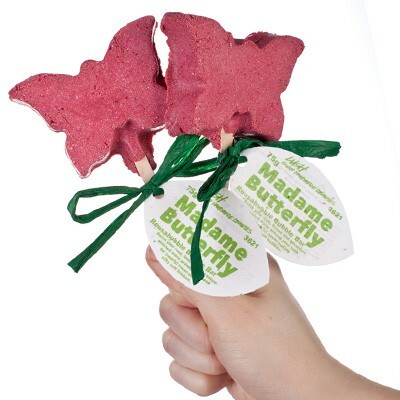 Possibly even a bath using my Lush Madame Butterfly reusable bubble bar on a stick. I bought this myself, because for me, there is no gift better than a little bit of peace and a few pancakes. I’ll admit, I’ve used it already. Because I am impatient and because it has the same beautiful rose, geranium and lemon fragrance as my favourite Rose Jam Bubbleroon from Lush. A day of peace. When they’re playing nicely together, there is nothing in the whole world that makes me happier than just watching my kids play. So, if they really want to get me the best gift, it will be a day of peace. No squabbling, bickering or fighting of any kind. All day long. I might as well ask for a miracle, but there is no harm in trying. While I’m on the subject of things I might as well ask for, if there is anyone who would really like to buy me this, I would love it. Not just on Mothering Sunday, I’d be happy to receive it any day you like. 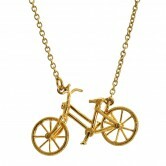 It’s a bicycle necklace from Alex Monroe. Not only is it utterly lovely, but the whole collection is named ‘Daisy Bell’, the first song I sang to my daughter when I was finally allowed to hold her, days after her very early arrival. Six things my mum taught me. Lovely post. I like that you mention your mother, mother-in-law and grandmother at the beginning. Also that necklace is pretty and you’ve reminded to pop into Lush at the next opportunity. Allotment update: Seeds or Seedlings?